Since a gymnast’s coaches are such a huge part of a gymnast’s success, we should definitely show them some extra appreciation during the holiday season. Many gyms will have some type of holiday party, which is a great reminder to give them something special. 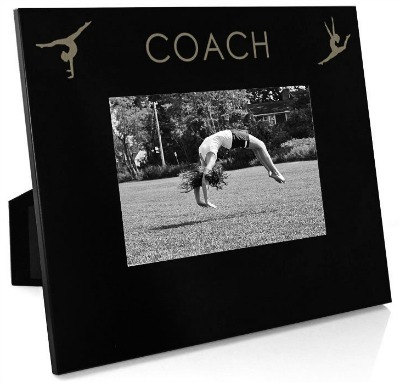 Without a party, it might not be on your radar, so just in case here are some gift ideas for your gymnastics coach. 1. Baked Goods – Of course, a nice Thank You note and baked goods are always appreciated, especially if you there are a lot of coaches on your list. I’d recommend putting the treats in a cute jar like this or this with some ribbon and this “Thanks for Being a Sweet Teacher” printable to spruce it up a little! 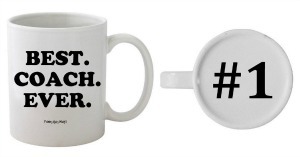 If you want to go the ‘great coach’ route–here’s a nice coffee mug. Or the Best. Coach. Ever Mug. And save yourself some time and buy your Starbucks giftcard online. 3. Kindle – If a whole level/class/team wanted to contribute $5 to $10 per gymnast to buy a nice gift, I think this would be a great present. Coaches are on the road a lot during competitive season, have frequent breaks at the gym in between classes, and breaks between meets. This would be a nice portable gift they could bring around with them. Depending on how many gymnasts there are and how much each person is contributing, you could buy this cheaper Kindle, or this Kindle with a built in light that is a little more. 4. 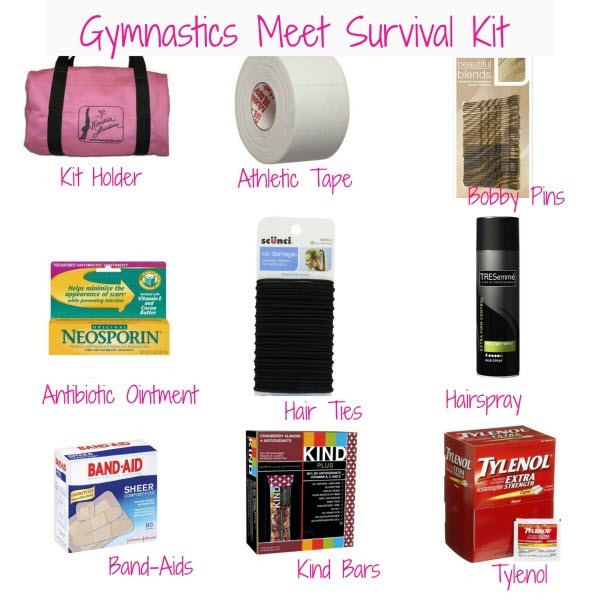 Gymnastics Meet Survival Kit- Gymnastics coaches are constantly dealing with problems at gym meets and putting together a little “Gym Meet Survival Kit” I think would be a cute idea. Put all the items in a small bag (or grip bag!) so they can bring it with them to meets so they are always prepared for issues that come up! They will be thinking about how thoughtful you are all meet season! Bobby Pins– These are multi-colored to blend in–for fixing gymnasts’ hair that just won’t stay put! Hair Ties– You can never have enough, and you never seem to have them at the right moment– now your coach will! Hairspray– I know when I coached I always needed hairspray to fix my gymnasts hair! Tylenol– individual 2 packs, you can just put a couple of the packs in the survival kit! 5. Spa in a Basket – When I think of gifts for coaches, I tend to focus on gifts related to relaxation. You can make your own spa in a basket or buy a pre-made one like this one , this one , or this one! 6. Luxury lotion – Along the same lines as the ‘spa in a basket’ idea, nice lotion is always a great gift for women in general, especially women coaches. Being in a chalky gym all day definitely does a number on your skin, especially on your hands. 7. Ornaments – On their tree for years to come! 8. 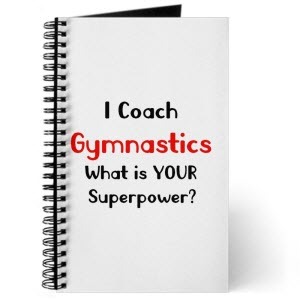 Personalized Gymnastics Coach T-Shirt– Personalize a gymnastics coach t-shirt for your gym coach! 10. Notepads – If your coach is one of those coaches that always has a notebook out making workouts, plans, keeping track of scores etc. 11. Frame – Give a frame with a picture of the group in it or even a collage of a lot of team pictures for them to hang in the gym. Choose either a basic one, or one where the kids can add signatures. 12. Gift Baskets – Because you can never go wrong with giving food! 12. Nice Vase + Flowers – Simple and classic. I hope you liked my gifts for your gymnastics coach or gymnastics teacher! cool, my coach would love the cookies.